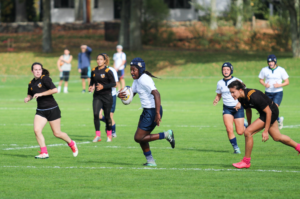 Quinnipiac rugby played its last regular season game against the American International College on Saturday afternoon. The occasion was fitting as it was Senior Day for eight Bobcats. The Bobcats celebrated the day by scoring a season-high 74 points in a 74-5 rout over the Yellow Jackets. The win on their home field also brought them to a 5-0 record in front of their home crowd. Senior fly half Flora Poole who had five assists in the match was happy that the parents were there for the festivities too. Senior center Ilona Maher, who was the national player of the year last season, had similar feelings on her final regular season match. After the seniors received honors at the opening, the Bobcats put on a strong display of rugby for their parents and the supportive home crowd. The team as a whole scored 12 tries and senior kicker Margaret Wesolowski knocked in seven conversions. Maher also performed well as she led the Bobcats with five tries. More than once Maher sprinted the length to beat the last Yellow Jacket down the field for a try. The first half was a definitive display of athleticism from the Bobcats as they used their speed and agility time and time again to beat the Yellow Jacket defense. One of Maher’s runs down the field really showed off her skills as she brushed off an American International player and then sidestepped another defender in one motion, after which she had a clear run to the goal line. Poole recognized the team’s off the field effort in strength and conditioning practice as the reason why she and her teammates were able to outperform the Yellow Jackets on both sides of the ball. American International College had one lone try that came with about seven minutes remaining in the first half after multiple efforts against a sturdy Quinnipiac back line. 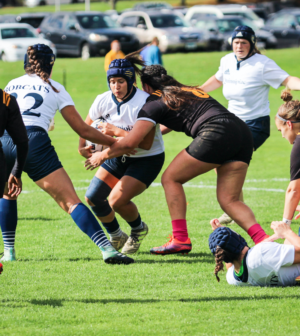 The Bobcats were able to respond before the half ended by putting up two more tries in the closing minutes from gradute student Taylor Schussler and junior fullback Emily Roskopf. The first half came to a close with an advantage of 45-5 in favor of Quinnipiac. The second half had a different tone, as American International College came out ready for the Bobcats’ speed. 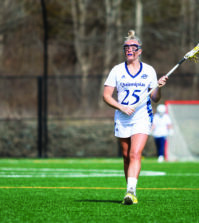 Quinnipiac head coach Becky Carlson noted that the second half adjustments were all about making effort on every play and doing the little things instead of running down the field at will. Although the Bobcats changed their style in the second half, the result was still much the same. They scored another four tries from textbook passing and hardy effort, running through the Yellow Jackets defense routinely. It was with seven minutes remaining in the second half that senior wing Rebecca Haight also joined the party by scoring the tenth try for the Bobcats. The win marks the Bobcats’ fifth straight against the Yellow Jackets. With that win in the books the season comes to a close, but the playoffs begin. Led by the seniors, the Bobcats have their eyes on their third straight NIRA championship belt. 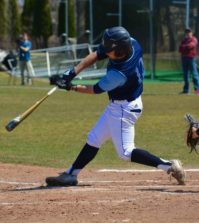 The other challenge for the Bobcats’ lies a bit further down the road when a group of decorated seniors will be moving on after the team’s playoff run. Carlson did not seem deterred. The NIRA Playoffs begin on Nov. 11 as the reigning champion Bobcats take their 7-2 regular season record looking to defend their title.